Pokerati » Blog Archive » Run It Twice? , who will step down in June after 18 years as president and CEO of the American Gaming Association, said Wednesday he believes a comprehensive federal bill legalizing online poker will be brought back to Capitol Hill this year. Fahrenkopf expects Rep. Joe Barton, R-Texas, to reintroduce an Internet poker-only bill in the House. Barton has tried before but failed to garner enough support in the House to pass an online poker bill. Senate Majority Leader Harry Reid, D-Nev., and former Sen. Jon Kyl, R-Ariz., were working on a bill last year, but it never materialized, much to the disappointment of Fahrenkopf and other gaming industry leaders. “I wouldn’t be surprised if a new bill was introduced in this session,” Fahrenkopf told gaming regulators and executives during a question-and-answer session at the 2013 iGaming North America Conference at Planet Hollywood Resorts. He said the association was “still hopeful something will get done,” but with Kyl’s retirement they are working to “find a conservative Republican from a nongaming state” to support a federal bill legalizing online poker. He said some far-right Republicans, who normally want government out of peoples’ lives, opposes any gaming for religious reasons. He said some on the far left believe people aren’t smart enough to make decisions for themselves and need government to be involved. “It’s a strange marriage between left and right,” Fahrenkopf said. 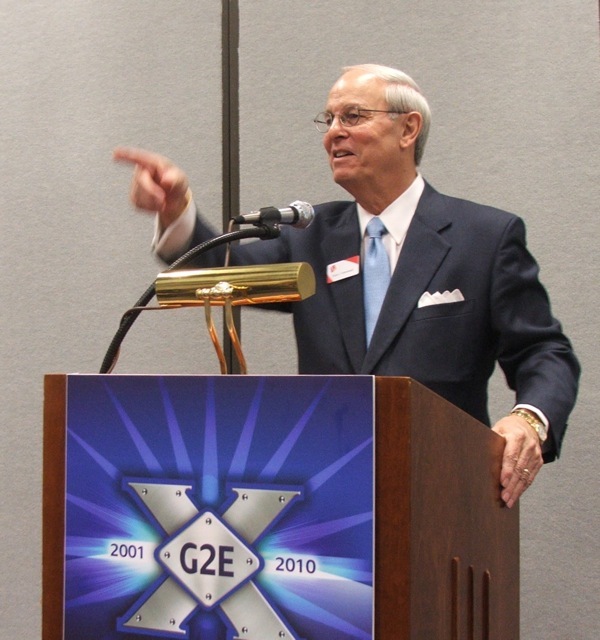 Fahrenkopf, 73, has led the Washington-based gaming industry lobbying group since it was formed in 1995. His resignation takes effect June 30. Despite efforts by Nevada, Delaware and New Jersey to legalize online gaming, Fahrenkopf believes a federal bill would be the best option for casinos, operators and technology companies. He said online gaming companies had to establish consumer protections to protect the integrity of the game, implement to prevent underage gambling, and implement programs to help the 1 percent of the population that can’t gamble responsibly. Fahrenkopf, a Reno native and former chairman of the Republican National Committee, warned that state compacts brokered to create liquidity for online states – that is, add enough players to make the venture profitable – would force Congress to block the partnerships. “When you are talking about wagering, I wouldn’t be surprised if Congress holds hearings,” Fahrenkopf said. He said federal approval for state deals in other industries has not been needed in recent years. But those deals didn’t involve real-money online gaming, he said. In taped remarks to iGaming North America attendees, Republican Gov. Brian Sandoval noted that Nevada was first state to implement online poker regulations. Sandoval said his administration would continue to push for interstate online gaming compacts. He said he expected lawmakers to pass a bill in 30 days that removes the final restrictions preventing online gambling’s full arrival. “It’s important to pass this legislation,” the governor said. New Jersey and Delaware are proceeding with efforts to legalize online gaming. New Jersey Gov. Chris Christie said Tuesday he would sign an Internet gaming bill if lawmakers make the changes he wants to the legislation. Christie wants a 10-year trial period on Internet gambling and higher taxes on the casinos’ online winnings. In Delaware, Lottery officials issued requests for proposals seeking bids from vendors to operate the state’s centralized online gaming system with the strict stipulation that it would be up and running by Sept. 30.